Middle Eastern artwork has emerged from the sands of Yemen, Saudi Arabia, Oman, Israel, Morocco, and Egypt. These early bastions of civilization and culture continue to inspire people around the world with their unique artistic expressions. From the Khamsa designs of Islamic and Judaic art to the clothing and jewelry of the Mediterranean states, Middle Eastern art has ancient roots and modern appeal. 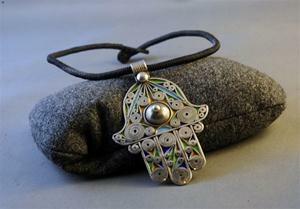 Our Khamsa pendants are among our most popular items. These amulets, shaped into the likeness of the human hand, are used both as jewelry and home decoration. 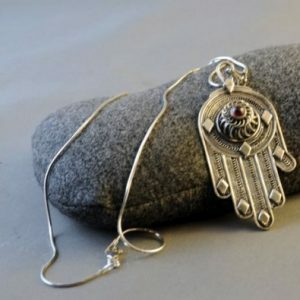 Believed to protect one against the influence of the evil eye, our Khamsa collection includes those from Italian, Moroccan,Israeli, and Yemenite jewelry artists. 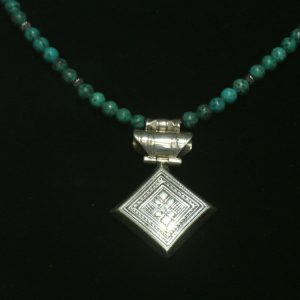 For Middle Eastern artwork representing heritage, prosperity, and good luck, our selection of Middle Eastern jewelry & art allows you to select a treasure for a friend or family member, or find something for your own home or institute’s collection. Shop Middle Eastern art at Spectrum Art Gallery LLC.